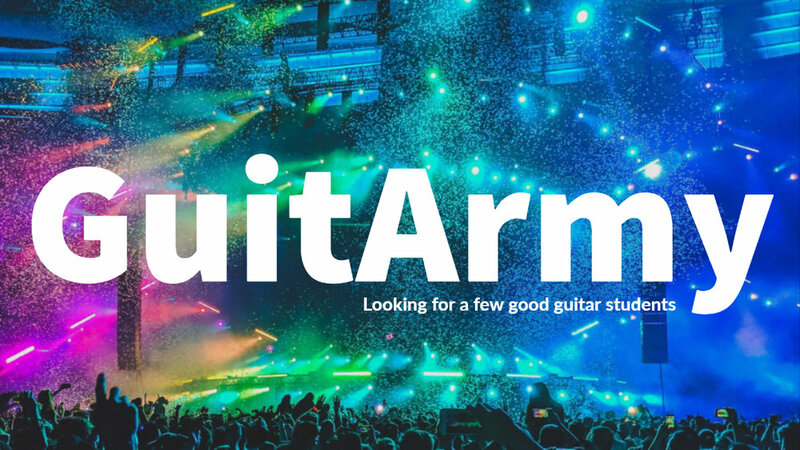 The Guitar Training Camp has a new monthly guitar learning platform called GuitArmy. It’s only $10 a month and you get access to all of our online courses, live events, and exclusive content. For more info please visit GuitArmy. The Guitar Training Camp is happy to announce that we’re adding 2 more instruments to our roster. We will now be offering ukulele and bass guitar lessons. The Guitar Training Camp will not be offering Lesson Packs anymore as of 3/28/19. We will only be offering weekly lessons going forward. If you’re a current Lesson Pack user contact us for further details. April Sale is happening! Take advantage. If you are a new student and you’d like to take advantage of this great offer just fill out the “schedule a lesson form” and don’t forget to put the coupon code at the bottem of the form. This is a video lesson from my upcoming course on minor scales. This is a video lesson from our upcoming online guitar course on minor scales. Please subscribe to our Youtube channel so you can get notified when the course is released. I really want one of these pedals! You got to listen to Josh Smith on guitar if you’re not familiar with him yet. Here’s the 3rd beginner in our series on how to strum guitar. New advanced guitar lesson available! Check out my newest guitar lesson on strumming. It’s the 2nd advanced rhythm I put out. Give it a try! I wanted the prices on my platform to be competitive with my course prices on other platforms so I lowered my courses to $15 each and $24 for my 2 course bundle. Click here to check out the new prices. Here’s a link to my lesson 8 for beginners on Skillshare. My guitar student Guy built this guitar and gave it to me for Christmas. I’m very thankful. Thanks Guy!!!! New guitar hero to watch! This kid is only 15 and is already killin’ it. I think he’s a little guitar legend in the making. Start around 2:42 and enjoy. If you would like to give the gift of guitar lessons to someone you can purchase an eGift card below for various lesson amounts. I just bundled my 2 beginner courses for guitar together at a great price. Click on the image if you’d like to check it out.